Over 240,000 tourists arrived in Sri Lanka in March, growing 4.6 percent compared to the same period last year, statistics from the Sri Lanka Tourism Development Authority showed here Monday. The leading markets for Sri Lanka tourism were India, Britain and China. 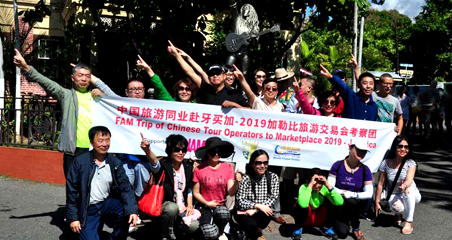 Chinese arrivals last month grew 12.6 percent compared to March 2018, with the arrival of 23,759 tourists. China accounted for 10 percent of the total traffic, while India accounted for 14 percent and Britain 12 percent. To date, this year, 78,212 Chinese tourists have arrived in Sri Lanka while the total number of tourist arrivals this year has been 740,600. Tourism Development, Wildlife and Christian Religious Affairs Minister John Amaratunga said the government was on target to reach its total aim of three million tourists by the end of this year. He said China being one of Sri Lanka's main markets, the tourism industry was expecting at least 300,000 Chinese tourists to visit the island country by the end of this December. Sri Lanka Tourism has emerged as one of the leading markets following the end of the country's civil war in May 2009. This year the government said it is expecting a revenue of at least five billion dollars from its tourism industry.